The small town of Lucas was presented the Governors Tourism Award and was named one of the 8 Wonders of Kansas Art in 2008. Lucas is world famous for the Garden of Eden built in the early 1900's by S. P. Dinsmoor, a Civil War veteran. The Garden, which is listed in the National Register of Historic Places, consists of a stone log cabin home and a mausoleum where Mr. Dinsmoor and his first wife are buried. The yard has over 150 cement sculptures depicting his interpretation of life and the Bible. Also located in Lucas is the Grassroots Art Center, the home of the Inez Marshall Limestone Sculpture collection along with artwork by self taught Kansas artists and traveling exhibits. 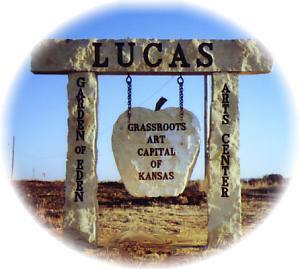 Lucas was designated the "Grassroots Art Capital of Kansas" by Governor Graves in 1996. Lucas is home to the Worlds Largest Souvenir Travel Plate and the Worlds Smallest Versions of the Worlds Largest Things Museum. Lucas is a farming community of 400 people nestled in the heart of Post Rock County and the Smoky Hills region of Kansas. It is located in Russell county at the junction of K-18 and K-232 highways just eight miles north of Lake Wilson. The state of Kansas has designated Highway 232 as the Post Rock Scenic Byway. Lucas is a small but active town that works hard to keep their community dynamic and growing. Florence Deeble was a child watching with curiosity, when S.P. Dinsmoor was constructing his Garden of Eden in Lucas. When she retired after a career as a high school English and history teacher, she began constructing her own grassroots environment of colored concrete scenes around her home. "Grassroots art" is a term describing art made by people with no formal artistic training . . . (usually of retirement age)using ordinary materials in an extraordinary way . . .